Over the past half century, the number of women in the workforce and their earnings rose markedly—not just in the United States, but worldwide. Yet in recent years, this progress has stagnated, and we’re still far short of gender parity in the economy. This is in large part because many workplaces continue to operate as if employees have no caregiving responsibilities. The global increase in women in the labor market hasn’t coincided with an equivalent rise in men’s share of caregiving. And in too many countries, laws and policies aren’t helping. Indeed, the gender wage gap is largely a motherhood gap: unmarried women without children earn 95 cents on a man’s dollar, but for married mothers with at least one child under age 18, this figure drops to 76 cents. The gender gap at work is fueled by a gender gap at home. Women continue to spend more time doing carework than men, which is not simply a reflection of personal preferences: gender disparities in caregiving are embedded in, and perpetuated by countries’ laws, and policies. The consequences for the financial well-being of women and their families can be enormous. To assess countries’ progress toward promoting gender equality in the economy and in caregiving, the WORLD Policy Analysis Center (WORLD) at the UCLA Fielding School of Public Health, together with our colleagues at the Maternal and Child Health Equity (MACHEquity) research program, recently released new globally comparative data and analyses on laws and policies affecting work and caregiving across all 193 UN member states. We examined the availability of leave following the birth of a child, for children’s health and education needs, as well as leave for the health needs of adult family members. The data show that while globally, countries are making some progress in promoting gender equality for workers with infant children, many countries still have a ways to go. Moreover, compared to infant caregiving, countries have made far less progress toward promoting gender equality when it comes to providing care for children beyond infancy or for elderly parents. The gains: paid maternal leave has become nearly universal. Today, 96% of countries provide either maternal leave reserved for mothers, or parental leave that is available to both parents. Since 1995, seven countries newly enacted paid maternal leave, more than 50 approved an increase in leave duration, and 20 raised payment rates. The gaps: still far too few countries provide leave to dads. While some countries are innovating ways to actively encourage men to be more involved through “bonus” leave time and other incentives, most countries lag far behind, despite research showing that paternal leave benefits children and families: when new fathers take leave, they are more involved with their infants, and care responsibilities remain more equally shared among parents even after the leave. 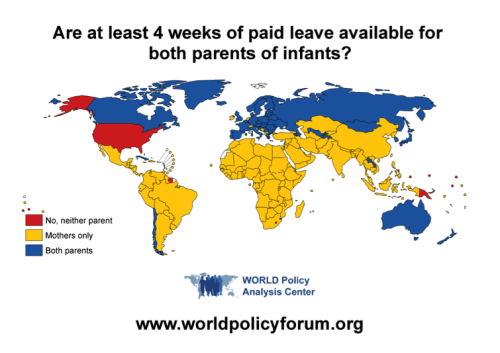 The U.S. stands out as a costly outlier, providing neither mothers nor fathers paid leave. Compared to the number of countries that provide leave to parents of infants, far fewer provide leave enabling parents to care for children beyond infancy. Only 60 countries provide parents with paid leave specifically for the purpose of caring for their children’s health needs, allowing both mothers and fathers to care for an ill child without loss of income; an additional 15 countries provide gender-neutral unpaid leave. 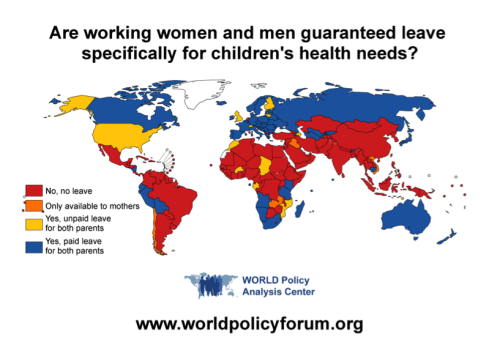 Five countries make leave for children’s health needs available only to mothers. Codifying into law the gendered assumption that women are the primary caregivers reifies this assumption and likely increases the odds that women will provide this care. Gender gaps persist not only in caring for children, but also in caring for elderly parents. A recent study found that daughters spend twice as much time as sons providing care for elderly parents, with daughters averaging 12.3 hours per month, compared to just 5.6 hours averaged by sons. Yet only 38 countries provide paid leave specifically for the purpose of caring for elderly parents, while 16 provide unpaid leave—leaving women to disproportionately carry the economic burden. When countries provide both men and women access to paid leave, this allows for greater equality at work and at home. When leave is unavailable, women are more likely than men to risk jobs or income to provide care—or even drop out of the workforce entirely. Providing both men and women with paid leave to care for their children and adult family members is crucial to ensuring workers don’t have to make impossible choices between maintaining a steady income and securing their family’s health. Jessica Looze, Aleta Sprague, and Jody Heymann, WORLD Policy Analysis Center, University of California, Los Angeles. To learn more about WORLD and MACHEquity’s new work and family data, along with other new policy data on adult labor and working conditions, education, child labor, child marriage, the environment, and constitutional rights, please click here.